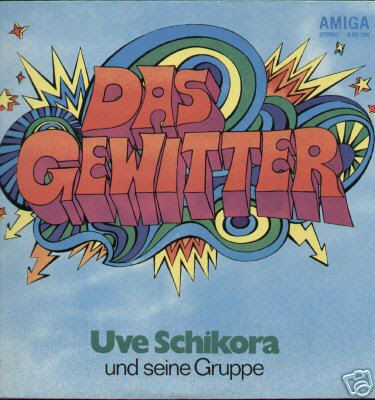 A highly recommended gem from the vaults of East German's Amiga label. a review on UK’S Vinylvulture describes 'Das Gewitter' (translated with 'the storm') sounding 'like Black Sabbath meets the Mohawks!' indeed the music featured here is a superb mix of Progressive, Funk & Krautrock including heavyduty hammond riffs, violent fuzz guitars leads, killer basslines, electric wahwah sax, over the top musicianship & above all, long numbers! big samples and breaks on the 12 (!) minute title track, which is loaded with wicked proggy beats supplied by funky organ culminating in some delirius rock drumming. 'Oh Angela' is a blaxploitation style tribute to Angela Davis with great lyrics in german. 'Deine Augen' kicks off with a catchy uptempo Funk Beat, turning in its 2nd half into a weird oriental freakout percussion groove. more exclusive proggy beats on 'So Einen Sommer Lang' featuring a mad midtempo fuzz break sounding just like 'Graves To The Graveyard' from 'The Last Rebel' soundtrack. absolute essential Euro Prog album .In parts reminding me the Zappaesque funky prog of Dutch band Doctor Dopojam,while hints of Xhol can be found in the instrumental parts. "An obscure DDR band, who took a step on from pop music, blending in psychedelia and Krautrock, to make something quite unique. Beyond Die Puhdys, quaintly dated, yet with the raw edge of invention, and hints of Nosferatu and Xhol in the instrumentals. It shows that, had history been different, bands like this may have blossomed like their Western counterparts. 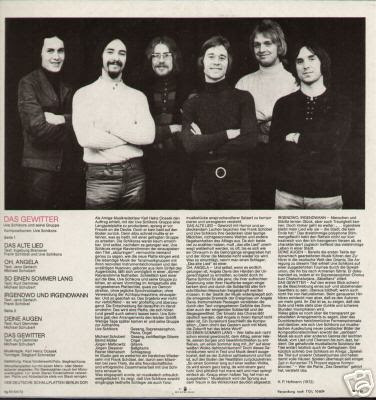 Uve Schikora (vocals, soprano sax, piano, organ), Michael Schubert (vocals, 12-string guitar), Bernd Müller (organ), Jürgen Matkiowitz (guitar), Jurgen Diessner (bass), Reiner Miehatsch (drums), + Frank Schöbel (vocals)." It reminds me on Brainticked (the last track) or Sweet Smoke. finally got around to listening to this one - thanks alot. interesting to compare it to another favorite release from that time - Hauch von Frühling by Manfred Krug. but true, this one has alot of "gedudel" im vergleich. i still think its interesting to hear what was being sold as pop music in the gdr back then. and ive heard stories of the weird underground around this time too. . no tapes though!